As noted on the hiatus notice on Starwalker, the end of Book 2 marks several milestones for the story. Two years; two books; just over 200,000 words! It’s bewildering when I think of it in those terms. I can’t believe it has been two years already! Averaging a book a year is pretty good, though, especially with everything else I have going on lately (I’m working on another novel in tandem with writing Starwalker, and I have a couple of other projects in the works too), not to mention my ever-questionable health. 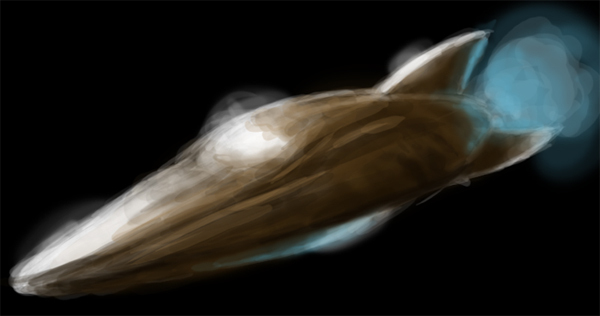 The first book wound up being about the identity of the Starwalker: the ‘who’ behind the ship’s tweaked AI. She had a lot of discovery to do, and a lot of decisions to make about the kind of ‘person’ she wants to be (inasmuch as that term applies to her!). The second book delves more into the notion of ownership (and, by extension, loyalty). As a ship that has been designed, commissioned, built, supplied, and paid for by a company, just what is her position in the world? How much autonomy does and can she have? Several things come up that make Starry question her priorities, and loyalty to the company might turn out to be more trouble than it’s worth. But what right does she have to break free of them? It’s a fun subject. I didn’t go into the legal side of it too heavily, because the Starwalker is largely acting outside the law at the best of times, but when it does come up, I’m sure the term ‘slave’ will be bandied about. I do love some complications! This is a tricky subject and there was a lot of ground to cover. I was almost to the end when I realised that I wasn’t going to get everything that I wanted to into the story arc: it was heading for an ending-point and there wasn’t any way to squeeze in one particular element that I wanted to do. (This plot-point will go in Book 3 now.) This is one of the pitfalls of writing on the fly like I do! I’m usually pretty good at steering things where I want them to go. I had to get the ship back to Earth’s solar system to make the end of the book work, and that was a challenge in itself! I did a lot of shuffling of pieces in my head to make that happen, but it meant that they couldn’t get to that one last place to finish off the Ownership story completely (Dyne, for those keeping track). It’s one of those things that I’ll fix up in editing, I think! On the whole, I’m pleased with how it all came out, and where the story is going. I also love the reactions I’ve had on the twist at the end: they were exactly what I was going for! The Starwalker universe is expanding and my poor little ship is going to have to sprint to keep up. This is something that I’ve had in mind for most of the time I’ve been writing it and it was so much fun to finally get to write it in there. It’s funny to think that I’ve been waiting two years to write some of this stuff! And there’s so much more to go yet. I’m two-thirds of the way through my original plot plan, and about to launch into Book 3. I’m not sure what to call it yet: the preliminary name is Repercussions, though I was also tossing up Responsibility for a while. Well, I’ve had almost a month off Starwalker, and it has been good to catch my breath. Soon, I’ll be starting the first bit of Book 3. Wish me luck!